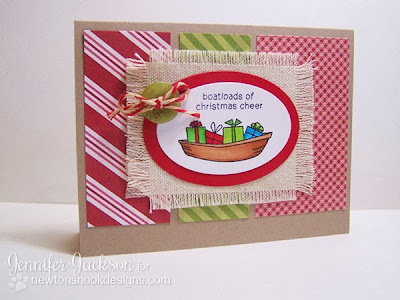 Newton's Nook Designs: SEAson's Greetings - 2 fun cards! He he he... that makes me laugh every time. I really love all the silly puns in the SEAson's Greetings christmas set! If you haven't checked it out yet, make sure to go over to the store and take a look. This set is really very silly and unique for Christmas! 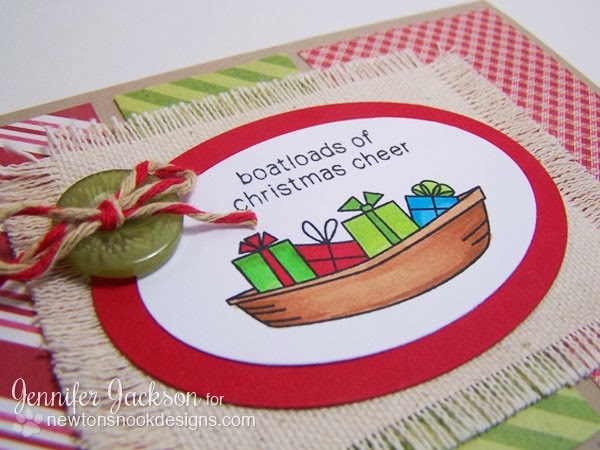 For this card, I colored the boatful of gifts with copic markers and cut it out with some oval dies. Then I added some fun linen fabric behind it and frayed the edges - thought that helped give a bit of a nautical look! Then I added some fun christmas patterned paper and a button with twine! Love how this turned out! 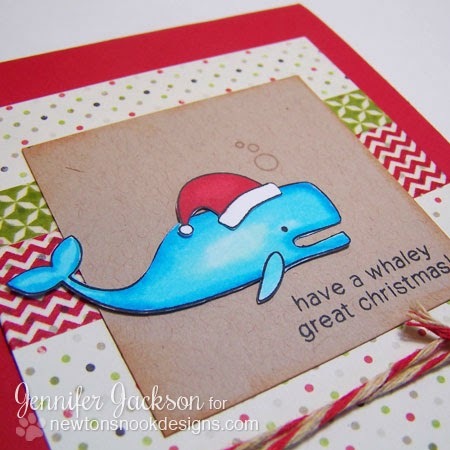 Next up is a card using the whale - Isn't he cute? I also stamped the santa hat from the Newton's Holiday Mischief set and cut it out to put on his head! I colored him with copics and fussy cut him out and added him to the kraft card stock. Stamped some bubbles and the "have a whaley great christmas" sentiment. Then I finished this card off with some patterned polka dot christmas paper and some washi tape. Plus a bit of bakers twine - can't seem to get enough of twine lately! 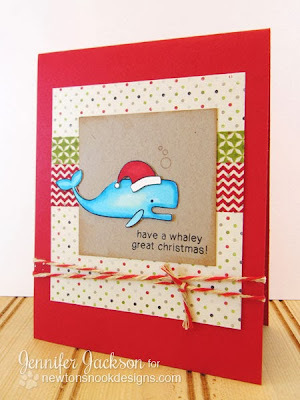 Hope you had a "whaley" great time checking out these cards today! LOL - Sorry, I couldn't resist! Really, really CUTE - both of them! I am totally digging that linen fabric out there; I need to get some! Super darling; dare I say, whaley wonderful, and a boatload of creativity! You've certainly amped up my Christmas spirit with these cuties!